Join us as we explore what it means to be a successful lawyer, a professional and a good person in 2018 and beyond. by Darlene Tonelli, August 21, 2018. This week, we’re continuing the process of giving lawyers a few tools to make a change toward a career that serves them and their clients. Last week, we asked you to make a list of things you find enjoyable. The idea is to make this list the starting point to see what use of your law degree would be the best possible use of your skills and talents. In my case, doing this helped me clarify that music played a singular role in my life that stood out from everything else that I enjoyed doing. Now that you have your list, hopefully you can see a few patterns emerging in your own life. But knowing what you like to do is obviously not the end of the story. The next step is actually much harder. This is the decision to move towards that career that you know is out there and that you would find fulfilling. 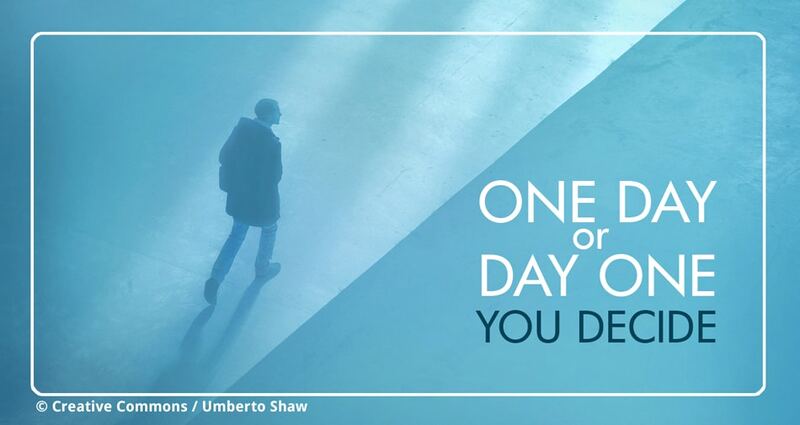 This is what we mean by “one day or day one: you decide” (author of this quote is unknown). believing that it’s possible to find work you enjoy while still being able to make a living. On the first point, how can it not matter? Since we have one life to live, we have to spend it in a way that allows us to look back at the end of our lives and feel we “invested” our time wisely. So much energy is spent on deciding how to invest money, but much less is devoted to deciding how to invest our hours in a way that maxes out our time on the planet. On the second point, believe it. Lots of people have jobs they enjoy. It’s not because they are magical unicorns. It’s because they believed in themselves and in the idea that the right job for them was out there. In some cases they made financial or other sacrifices to get into the dream industry (as I did). But in all cases they took an action – they applied for the right job, or created it – and were persistent until the opportunity presented itself. “If you change the way you look at things, the things you look at change”. Not rocket science, but if you start to look at the world as a fundamentally friendly one in which things can line up to help you to be your best self, opportunities will present themselves. It then becomes your job to spend the time to decide what it is that you really want, versus what you fell into after law school for (maybe) a lot of the wrong reasons. Once you can allow yourself to imagine a better way to spend your day, start focusing on how you will feel once you achieve that goal. What does it look like exactly? It makes a lot of sense to focus your energy on that rather than constantly focusing energy on bolstering the story that what you want isn’t possible. Either way it takes energy to sustain a story – might as well work on one that serves the important purpose of creating a life filled with days that you enjoy. This week’s actionable step is to write out your new story. Or maybe a few versions of it. See what feels like a fit. What you’d like to do, what you want your day to involve (start to finish). This is personal to you. Once you can see it in writing it’s easier to believe in it. If you’re visual, you may need pictures to motivate you. But either way, you can lend your story an air of reality as a start. Then DECIDE that you are going to line yourself up with this story, however you define it. This is Day One. Hopefully not “one day”. Next week, we’ll look a bit deeper into what happens after you make this mental leap. It’s not always easy and there are always “U-turn” moments that present themselves.